With its ornate spires, elaborate friezes and 53-meter-high central cross, the Albert Memorial surely ranks among London’s most impressive monuments, and it’s impossible to miss, standing proud over the south entrance to Kensington Gardens, opposite the equally grand Royal Albert Hall. 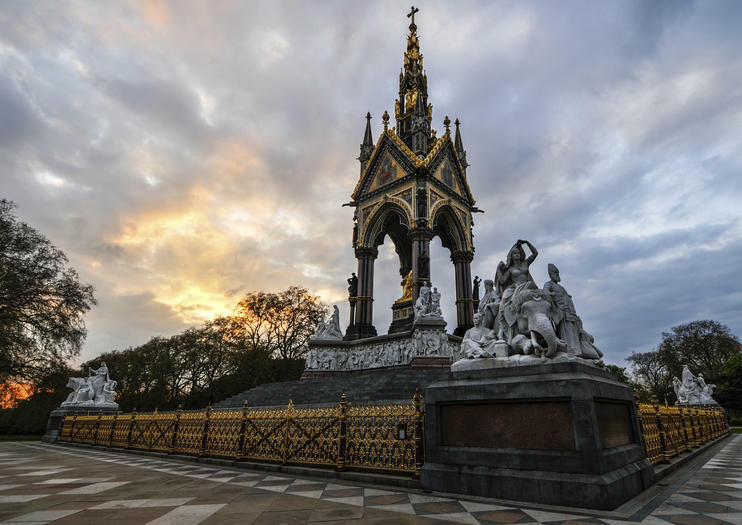 Inaugurated by Queen Victoria in 1872, the striking memorial is dedicated to her beloved husband, Prince Albert, whose untimely death of typhoid fever in 1861, at just 42 years old, had left her grief-stricken. Devoted not only to Prince Albert, but to all his passions and achievements, the masterful Gothic design is the work of Sir George Gilbert Scott and features a central gilded statue of Albert, holding the catalogue of the 1851 Great Exhibition. Surrounding statues represent the Prince’s main areas of interest - engineering, agriculture, commerce and art, while the intricate frieze at the base of the monument features images of 178 artists, poets and musicians, a further tribute to his love of the arts. The Albert Memorial is located in Kensington Gardens, London and is free to visit, although interior access is only possible by pre-booked guided tour. Get a local's insight into life in the British capital on this private royal-themed walking tour. In the company of just your party and a royal-expert guide, visit such sites as St. Mary’s Hospital, birthplace of many royals; Kensington Palace, residence of the Duke and Duchess of Cambridge, and Westminster Abbey, setting for the funeral of Princess Diana. With a wealth of new knowledge about the royal family, conclude your tour at the famed Buckingham Palace. Fans of "Downton Abbey" don't want to miss the chance to see London filming locations from the TV series. This private walking tour takes you to top attractions such as Hyde Park as well as lesser-known city sights where Lady Mary and other characters filmed scenes, providing a behind-the-scenes look at how the show was made. You'll also see locations from "Mr Selfridge" and "The Halcyon," two other British period dramas. Taking a tour in an iconic black cab is a special experience. Nobody knows the streets of London as well as a cabbie. We have spent 3-4 years learning over 20,000 streets and 30,000 points of interest so that we can get you from A to B in the shortest time possible. Your drive is also a qualified taxi guide. Put these 2 skills together and you have a unique driver/guide. We know how to meander through the cities street network, making the most of your time. We are able to cover the whole city, making sure nothing is missed while you sit back and relax. At all the sites, we are able to stop and exit the taxi to get up close and personal. You will receive a stand up presentation and have the opportunity to take those iconic snaps. This is a great way to use your time wisely and discover the whole of the city. Your personal driver/guide will deliver stand up presentations at all the main sites and provide a running commentary along the journey, uncovering 2000 years of history. This private walk is a two hour tour in the neighborhoods of Kensington and Knightsbridge. During the walk we look at the history and development of the area known as Albertopolis. See more of London with a full-day city tour and lunch cruise along the River Thames, including hotel pickup and drop-off. Start with free entry to Madame Tussauds and the London Eye, then set sail on the Thames for a 1.5-hour round-trip journey from Tower Pier to Westminster. Savor a delectable 2-course meal, and admire riverside sights such as the Tower of London and Parliament. Finish with a private bus tour of London’s key attractions, including Westminster Abbey, Princess Diana's Memorial Fountain and Trafalgar Square. Pricing is per group, based on a maximum of six passengers.